Buried at Dozinghem Military Cemetery, Belgium. Thomas MANSELL is commemorated on Trelewis War Memorial. His link to the village of Nelson is that he is recorded in the Parish War Memorial register at St Mabon's Parish Church, Llanfabon. 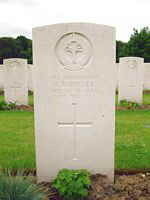 Private Thomas Mansell, Welsh Guards, aged 33 years.